CWDM VS DWDM differ noticeably in the spacing between adjacent wavelengths. DWDM packs many channels into a small usable spectrum, spacing them 1 to 2 nm apart; DWDM systems support a high channel count, but also require expensive cooling equipment and independent lasers and modulators to ensure that adjacent channels do not interfere. CWDM systems, on the other hand, use 10 to 25 nm spacing, with 1300 or 850 nm lasers that drift less than 0.1 nm/c. This low drift eliminates the need for cooling equipment, which, in turn, reduces the total system cost. As a result, CWDM systems support less total bandwidth than DWDM systems, but with 8 to 16 channels, each operating between 155 Mbps and 3.125 Gbps to over 100 Gbps. Typical systems support eight wavelengths, data rates up to 2.5 Gbps per wavelength, and distances up to 50 km. CWDM uses lasers with a wide channel CWDM wavelength spacing. In contrast, DWDM, which is widely used in long-haul networks and some metro core networks (particularly those with large diameters), uses lasers with much narrower wavelength spacing, typically 0.8 or 0.4 nm. The wide channel spacing of CWDM means a lower system cost can be achieved. This lower equipment cost is the result of a lower optical CWDM mux/demux cost (due to wider tolerance on the wavelength stability and bandwidth). CWDM represents significant costs savings-from 25% to 50% at the component level over DWDM, both for equipment OEMs and service provides. 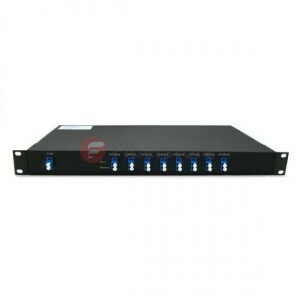 CWDM products cost about 3500 dollars per wavelength. Traditional CWDM only scale to about eight wavelengths, but for metro access applications, this may be adaquare. Also, mux demux manufacturer china have found ways to combine CWDM with its regular DWDM blades that allow the systems to scale up to 20 wavelengths. CWDM system architecture can benefit the metro access market because it takes advantage of the inherent natural properties of the optical devices and eliminates the need to artificially control the component characteristics. CWDM Uncooled Coaxial Lasers: Distributed-feedback multiquantum well (DFB/MQW) lasers are often used in CWDM systems. These lasers typically come in eight wavelengths and feature a 13 nm bandwidth. Wavelength drift is typically only 5 nm under normal office conditions (say, with a 50℃ total temperature delta), making temperature compensation unnecessary. For additional cost savings, the lasers do not require external gratings or other filters to achieve CWDM operation. They are available with or without an integral isolator. CWDM Transmitters/Receives: OC-48 CWDM transmitters typically use an uncooled DFB laser diode and are pigtailed devices in a standard 24-pin DIP package. Six to eight channels are supported (six channels: 1510 to 1610 nm; two additional channels are located at 1470 and at 1490 nm.) The OC-48 receiver typically uses an APD photodetector, has a built-in DC-DC converter, and employs a PLL for clock recovery. Transmission distances of up to 50 km are achievable with these modules. CWDM Multiplexers/Demultiplexer: These come in 4 or 8 channel module, just 4 channel CWDM Multiplexer or 8 channel CWDM Multiplexer, typically use thin -film filters optimized for CWDM applications, with filtering bands matched t other CWDM wavelengths. Filters need to feature low insertion loss and high isolation between adjacent channels. CWDM Optical ADD/Drop Modules (OADMS): These are available in various configurations with one, two, or four add and drop channels using the same thin-film filters as the CWDM mux and demux modules. Now Fiberstore is doing with 30% of the price discount of CWDM/DWDM products, and if you have interested in it, welcome to visit our online store.